It’s around 25-27 sq. m. It’s suitable for 1 or 2 person, also for 2 adults and 1 child under 12 years old who shares a king size bed with the parents. There is space for a baby bad. The Rilets Resort & Spa Deluxe Rooms are elegantly furnished with lots of fancy and desire to provide our guests the best repose and relax. Colored in warm and soft colors with relaxing effect. You can see the amazing Rila Mountain view from the balcony or the wide windows. You could choose between 2 options: superior room with a king size bed or superior with 2 beds. Both types of beds are with luxury mattresses with memory foam – for a maximum comfort and recovery during your sleep. 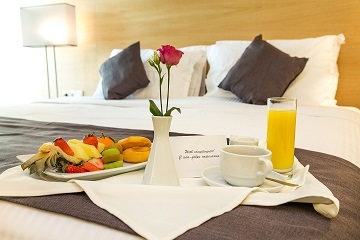 There is a minibar in each room and possibility for free tea or coffee preparing – as a compliment from the hotel. There is also an elegant working space with high speed Wi-Fi in case you can’t disconnect from your business even for a moment. Part of the Rilets Resort & Spa conveniences are also the LED lighting and the individual heating control, the electronic door locking as well. There is a bathtub or shower in the bathroom. There are also cosmetics, dryer, slippers and bathrobes for your convenience. The guests use the fitness center, the indoor heated pool, Jacuzzi, steam bath and sauna for free.